Take Care of Your Potted plant at Your Home Office Dormitory! batteries are available), then the system will automatically water your plant and flowers on time. 1.The indicator light on the control panel will turn red if low power, which means you should replace the batteries. beeping to inform you to add water, or you can relieve the beeping with the press of any key. Watering for 1-8 potted plant, just simply set up the device watering schedule. 3-Way Diverter Valve(7 pcs)，Filter(1 pcs), NOT INCLUDE Batteries. Notice: Be sure the tube plugged into the deepest of the drippers to prevent leaking water. DIY 1 ~ 8 pots watering project as little as 15 minute. THEN PRESS THE ON/OFFE BUTTON again,or else it can't pump water out. Notice：Batteries are not included, please prepare. Please according to your plant need to set the watering time and interval time to avoid flood. 【Quantitative&Timer Irrigation Kit】 - Interval time ranges 0.5-30 days from 10-99 seconds watering time settings. Etc.,if you set 30 days interval times,and it will water your plant after 30 days again,no need to set the interval time again. IMPORTANTLY,please keep enough water and batteries power if you have a long vacation or long time leaving. 【How to Pump Water】 - Please refer Steps Picture on Amazon to install. After install all the hoses, first to press the ON/OFF button, second set up the interval time and watering time you want, last step press ON/OFF button again and it will pump water soon. All-in-one drip irrigation system can be installed within as little as 15 minutes. 【Water-saving Design】 - Save 30% water than traditional spray & drip heads, like drip little rain, making your drip system great for saving water in drought conditions. Please watering the similar plant and flowers, because different plant need different water. After finished the seventh step, please test the pump and the hoses to prevent no water out or leakage. 【Time and Energy Saving】 - Very convenient for daily using especially if you don't like watering or you are too busy to take care of your plant, the item is a good solution to save you time and energy with a water pump and a timer. Your plant will grow healthily even when you go on a vacation and are lazy at home. Perfect helper for your home, office, dormitory, etc. 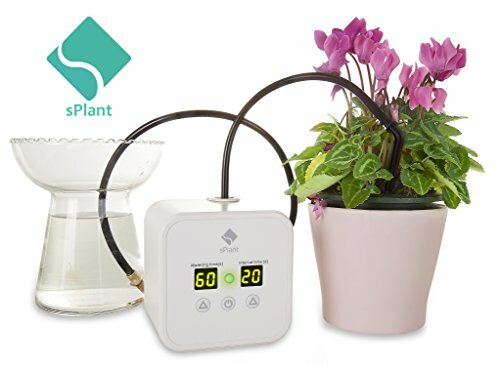 【100% Quality Guarantee】 - All customers buy sPlant self-watering kit in our store, if there is any quality problem or any suggestion when using, please feel free to contact us!sPlant Service Team will reply you within 24 hours, we make sure you are 100% satisfied and pleasant with shopping experience!We take pride in getting things right! If you have any questions about this product by sPlant, contact us by completing and submitting the form below. If you are looking for a specif part number, please include it with your message.